Happy Monday morning, its going to be a busy week here in Chicago with month ending so lets get to it. Focus of the Ag markets will be the grain stocks/acreage report that will be released on Friday. The markets outside of the Ag space may be a story as well with equities and the USD under fire as the week of trading begins. I would have thought dollar weakness would have helped US row crop prices but the bears remain in control at this early juncture of the week. It will be very interesting to see how the markets handle additional bearish data given the amount of selling we have seen by the funds over the last 2.5 weeks. The change in sentiment is amazing. Since Sunday night March 10, July KC wheat is off 60 cents on more anticipated (now realized) moisture in the KC wheat region. Total net short position as of last Tuesday equals what it was near the lows in October. December corn futures are off only 20 cents from the same period, while the net position has seen a swing of over 120,000 contracts. November soybeans have seen a similar shift of positioning with prices off almost 50 cents from the high 3 Sunday’s back, while funds have taken their long position off the table and back to levels not seen since the US harvest. Cotton….well cotton is the outlive. Almost every market on the books is seeing selling or has seen selling over the last three weeks EXCEPT for cotton. 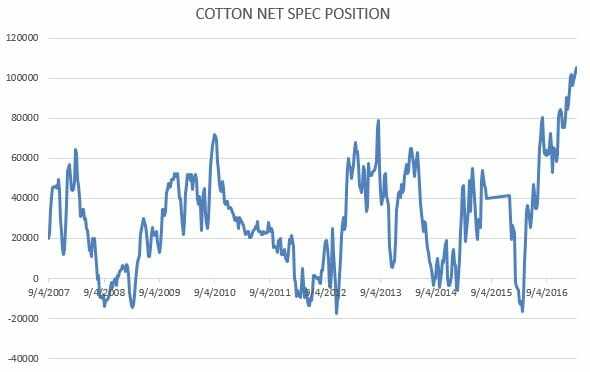 Cotton is trading just off recent highs in December futures, and the net long position remains monstrous. Bottom line, the CBOT markets have the bearish news basically baked in. 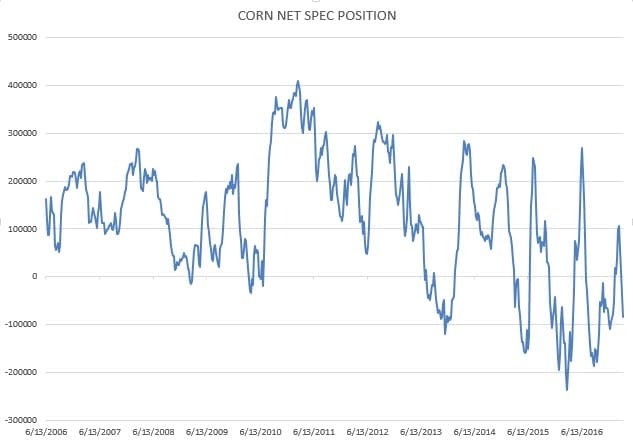 This is not the time to turn bearish in corn/wheat. I would look at buy side collar strategies in both if you have interest in owning. Soybeans may have more push depending on the report. Keep in mind the charts below do not include the selling seen across the CBOT in the latter part of the week. I think its safe to assume the charts are even more drastically tilted to the sell side. 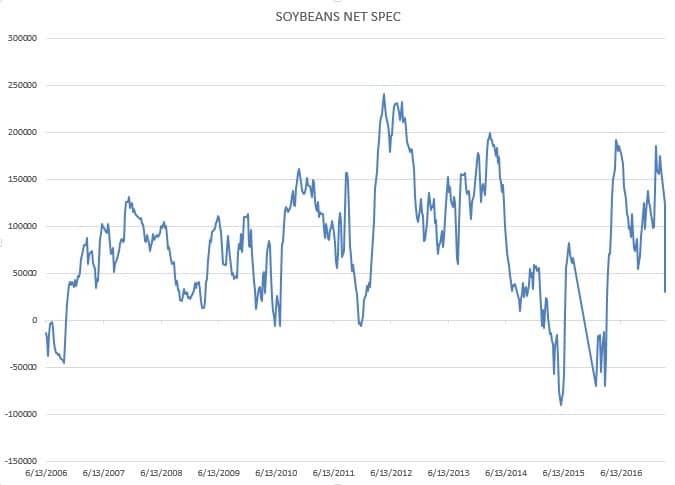 I think wheat and corn could be back near record lows while I imagine soybeans are closer to net neutral overall. Cotton would remain record long of course. So what gets things turning around? Well, in the case of wheat its difficult to find much. 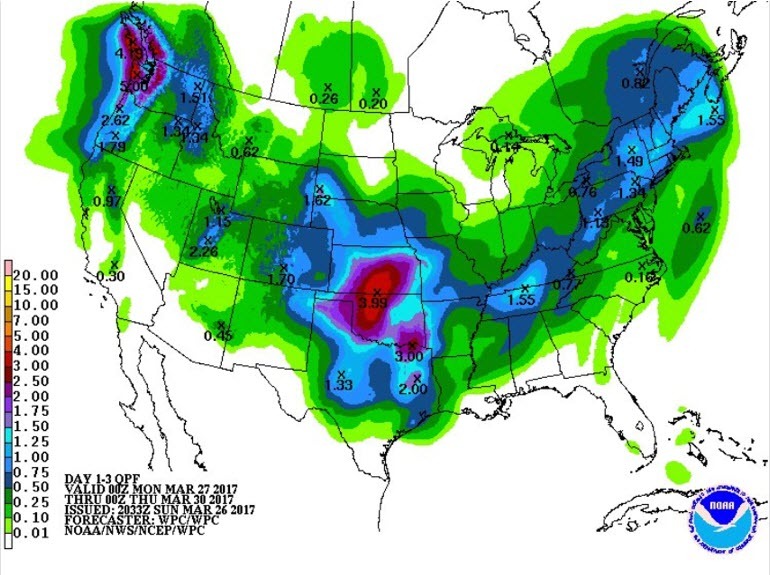 Parched KC wheat regions received the projected moisture most expected, and the forward outlooks call for more.The wheat acreage data is probably going to be supportive, while the grain stocks will lean bearish. 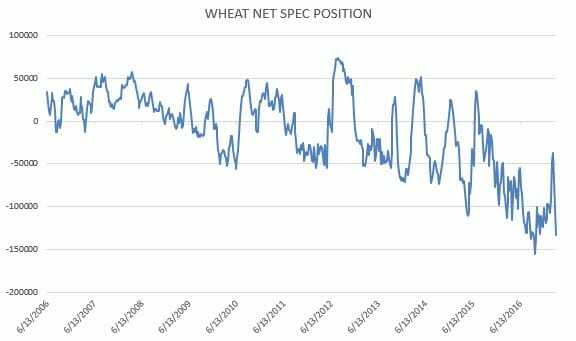 I think we make near term lows in wheat this week, given all of the bearish factors priced in and the lack of a need to sell at these lows by end users. Seasonals remain weak for wheat through mid April. I remain long from the 450-460 area in July and am choking on it at this moment. I am prepared to hold longer term but a push toward 4.00 May appears likely. Egypt announced that it will not allow private imports of wheat during the harvest season that runs from mid April through mid June. Private imports of wheat have already been sharply reduced following the Gov’t decision to allow the pound to float freely. This placed extreme financial pressure on private importers amid a lack of financing in US dollars. GASC has taken on a greater wheat and vegoil importer role as a result. IN the case of soybeans, there are some wild cards out there. The acreage data is the first one. Given the amount of selling while the survey was going on, I do not think its a stretch to think bean numbers come in below the Ag forum. There are also some weather problems approaching in Argentina where too much rain could slow the harvest. This is worth noting. The Chinese markets for soybeans have fallen to three month lows this morning, which is probably having more effect than anything else. I remain steadfast in the belief we see 10.30 nov beans again at some point in the future but it probably needs to come from US weather problems, which definitely could happen given the amount of projected moisture but the planting is so far down the road the market may not react for a while. Corn markets feel like they are bottoming here, but a push down another dime wouldn’t shock me. I want to buy the break in corn if we get the chance. I will be buying Dec 17 corn at 370. I think there is long term chart support in those areas and the potential fund position will be massive at those price levels. Do not turn bearish here, this is the time to play the bottom side of the range that should be very supportive until US new crop supplies are better known. Consider rolling hedges or adjusting them at those levels. I expect cotton to shift its focus to the new crop in coming weeks. Expecting tightness with 12 million + US acreage is a stretch. Record OI makes this market very vulnerable to a break. The average guess on Friday is 11.4 million acres but I highly encourage traders to be ready for the 12 number. The expected jump would put new crop ending stocks as high as 7 million bales vs the 4.5 million right now and 3.8 million a year ago. The technicals look bullish as anything I have ever seen which is very, very concerning but I think its prudent to cover risk here. With the Trump optimism waning and the net OI record long (see above), folks should look at protection not aggression here. I know I have been a broken record on this but the seasonal highs for cotton are typically made between now and May 1. Ill be back tomorrow and through the week with some strategies on how to get involved if you are still on the sidelines. Have a great week!